Cadillac has partnered with the Spring Mountain Resort and Motor Club to bring fans and owners of the Cadillac CTS-V a driving experience sure to both thrill and educate. Cadillac knows that if it wants to be considered a performance marque, then it needs to at least offer the same driving experiences that its competitors do. 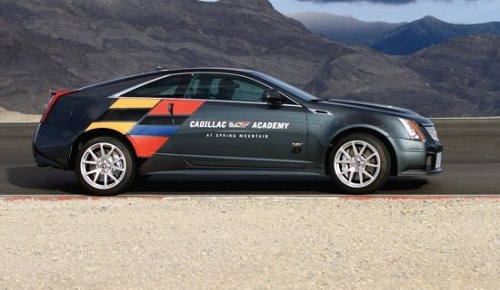 For that reason Cadillac has created its own CTS-V driving academy. The new academy will be hosted by the Spring Mountain Motor Resort and Motor Club. Located just a short drive West of Las Vegas Nevada, the resort has all the amenities one might expect of a posh private race track, but the Cadillac Academy is open to the public. The track features four miles of racetrack and has 125 feet of elevation change throughout the course. John Morris, the resort’s co-owner comments on the track via its website, saying “I didn’t want just another racetrack. I wanted to create something that made people feel special. A place that made them feel like they were at a resort – someplace comfortable where they could relax with friends, entertain clients or enjoy family time after a great day of racing.” The track can be configured 20 different ways in order to keep it exciting for long-term customers. The clubhouse is an 8,000 facility featuring a fitness center, shooting range, climbing wall and other activities. In addition to the Cadillac V car academy, the club also has a Corvette driving academy for those GM fans who might own, or aspire to own, GM’s two most powerful models. Torque News can confirm that Mr. Butler is correct. Last fall members of the Torque News staff had the opportunity to visit the Monticello Motor Club, a private track in New York State, as part of a press day at the track. The club features its own exclusive driving instruction for members. Pro drivers use Cadillac CTS-V and other Cadillac products to help the members hone their skills on the course. We had the opportunity to drive the Cadillac CTS-V on the course back-to-back with a ZL-1 Camaro and found the two to be extremely similar in feel. Driving a station wagon with a manual transmission, almost 600 hp, and magnetic shocks is a unique experience. However, the biggest thrill of the weekend was the course familiarization lap provided by a professional driver in a Cadillac Escalade ESV. You have not lived until you have drifted through a sweeping corner in a monster sized SUV with 7 other fellow enthusiasts at triple digit speeds. Cadillac is taking reservations now and those interested can sign up at www.CadillacVAcademy.com.